Curbside's newest technology improves predictive capabilities for restaurants. Today, Curbside, a Silicon Valley startup that connects stores and restaurants with mobile customers for companies like Pizza Hut, CVS, Sephora, and Nordstrom, is announcing a public software development kit (SDK) for ARRIVE, Curbside’s predictive arrival technology, which accurately determines when someone is approaching a physical store—all without draining the customer’s smartphone battery. This tool will be available to developers to incorporate into any iOS or Android app—no check-ins required—and will give them a chance to explore applications for the technology across the restaurant and food domain, as well as many others. ARRIVE is a tool for seamlessly bridging digital and physical worlds. It’s the first thing we built when we started the company, which made a lot of sense given our backgrounds working on location technology for iOS at Apple. Curbside is excited to be opening it up to the broader developer community to incorporate into any iOS or Android app. ARRIVE makes a predictive determination that someone is approaching a physical site using their smartphone, without draining their battery. ARRIVE also provides a definitive understanding of when users are at locations, as well as visualization, metrics on how long they spend there, and more. It alleviates the need for check-ins. The ARRIVE SDK already runs on millions of smartphones, built into the apps of Sephora, Nordstrom, Pizza Hut, CVS, and many others. We’ve helped our partners service tens of millions of customer trips across thousands of locations. ARRIVE alerts our partners when their customers are approaching, allowing them to provide a premiere curbside pickup experience, better in-store service, food that’s out of the oven just as the customer pulls up, or a dressing room ready with reserved items inside when the customer walks into the store. ARRIVE continually learns from patterns of arrivals—taking into account real-time traffic, real-world patterns of approach on road networks, and hundreds of other inputs to make a confident determination of when a customer is arriving. Developers sometimes assume they can use geofences or beacons to know when users are approaching or have arrived. Geofences are a distance-based technology, essentially setting up a radius around a location. If the radius is too large, you’ll get false alerts when customers aren’t really on their way. If the radius is too small, alerts are likely to occur after the customer has already arrived, if at all. 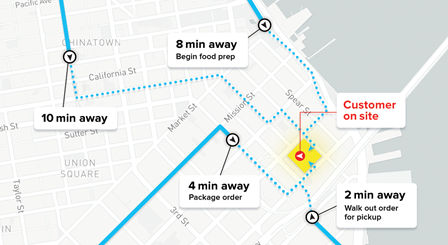 ARRIVE gives a time-based notification, which corresponds to a very different distance in a dense urban area than it does if the customer is approaching on a freeway in the suburbs. Beacons also don’t work for mission-critical arrival alerts—some 40 percent of users disable Bluetooth on their devices—42 percent of Curbside app users disable Bluetooth; other app developers also report rates between 35 percent and 45 percent. Even when Bluetooth is on, beacons have a high failure rate for outdoor use and can be painful to deploy and maintain. The ARRIVE dashboard offers real-time visibility and analytics on customer trips, including valuable statistics, such as how long users are spending at a location or how long they are waiting for an action, like an order handoff, to complete. Alerts and customer trip status can be consumed wherever and however you want, with an SDK for native apps and a REST API and webhooks for desktop, web, or other systems like point-of-sale. Or you can use the ARRIVE Console to get alerts, visualize trips, and close out orders. Curbside focuses on helping partners build great experiences without aggregating and selling their users’ location data for advertising purposes. As digital and real-world commerce continue to blend, new opportunities to innovate on customer experience are opening up across retail, food, hospitality, travel, and other domains. Curbside built ARRIVE to help businesses explore those applications.